Pricing is critical to ecommerce success. After all, customers can get a range of prices for the same or similar products in a matter of seconds. You have to walk a careful line. Make your products too expensive, and you lose sales. Set prices too low, and you lose margin. 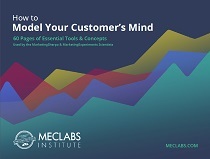 To help you gain a sense of how your peers in the industry handle this challenge, in this Marketing Research Chart, we'll share gross margins at different company revenue levels. 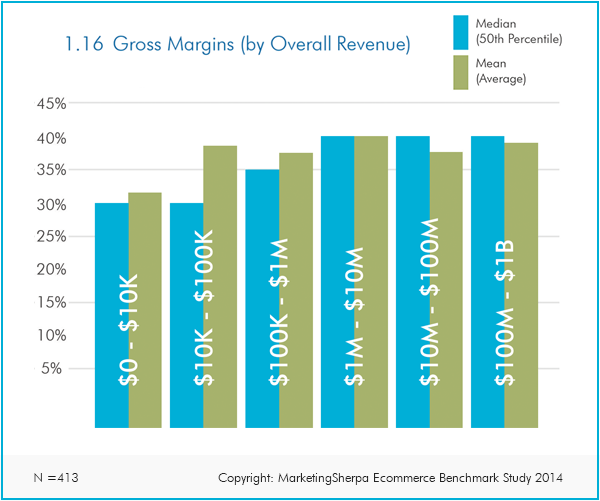 After analyzing the data from the 4,346 ecommerce marketing professionals who participated in the MarketingSherpa Ecommerce Benchmark Study survey, we identified four factors that differentiated the most and least successful companies. Recently, we shared data about product value. For this chart, here is some of the data we collected about another one of those key differentiating factors — gross margin level. Keep reading below the chart for our analysis, which may be helpful to consider as you set gross margins for your company's products. One of the metrics we asked about was gross margin percentage. Gross margins tended to increase as companies' overall revenue increased. However, once companies reached a certain critical mass — in this case, roughly $1 million in overall revenue — margins tended to hold steady. So while companies earning more than $1 million in revenue reported a median gross margin of 40%, companies with under $100,000 reported a median gross margin of 30%. To oversimplify a complex business decision, when it comes to gross margins, companies have two options. Ecommerce as a whole is growing at the expense of brick-and-mortar stores thanks to its convenience, lower capital and low overhead requirements, but that same convenience comes with a downside. While buyers in the past have had to overcome the friction of going to multiple stores (or at least calling or looking in multiple newspaper circulars), today's buyers can find competitive prices easily online. Ecommerce websites are responding to this transparent marketplace and price sensitivity. For example, Thad Rueter recently reported in Internet Retailer ("The price is right — then it's not") that 20% of prices change daily on competitive products. While price competiveness can be a business model in itself, you must focus on operational efficiency to be successful. As one Benchmark Study survey respondent shared, "Margins was the challenge; negotiations with vendors was the solution." This is an incredibly hard model to execute successfully in the face of very large competitors with logistics excellence and pricing power over wholesalers and suppliers, like Amazon and Wal-Mart. Another goal with intentionally low margins and price competition for many companies is new customer acquisition. While you can lower margins to increase business, keep this fundamental point in mind: What disruptively positive customer experience have you created? Without a disruptively positive experience to show the enhanced value of purchasing from your site, you have not acquired a new customer with your lower margins — defined as someone who now prefers your site and will consider it above others (even, sometimes, as just a tiebreaker when confronted with two similar prices). You have only acquired a one-time buyer who will not remember your site and will only buy from you again by random chance, or possibly if you happen to have the lower price again. This could even be a piece of in-product content. Here's a nontraditional example from the brick-and-mortar world to get you thinking: Content Marketing: How a farm justifies premium pricing. One Benchmark Study survey respondent lamented, "Margins are under significant pressure, and sooner or later customers will have to choose between price and service — they can't get Rolls-Royce products at Trabant prices forever!" Which brings up the question: "Why can Rolls-Royce charge more than Trabant (which is a former East German automaker)?" The answer for Rolls is the same answer for your ecommerce store — value proposition. Your company's value proposition is the answer to the question, "If I am your ideal prospect, why should I buy from you instead of any of your competitors?" If you can't simply answer, "We have the lowest price," you need an answer that demonstrates the enhanced value of shopping on your site. Content marketing can support this value proposition by showing the work behind the increased value your company offers. There is more information about both of these topics in the Related Resources section below.